They have widely circulated a new Thistle Assistance Card which the holder can use to advise the bus driver/public transport operator of any special help that is required. A card holder simply peels off a relevant sticker - such as sight, hearing, speech or mobility - and attaches one or more in a space provided on the front of the card. The holder can provide additional information of the back of the card that they think may be useful to the bus driver. She said: "People with disabilities often need a little more time to get on and off public transport to have a safe and comfortable journey to their destination. The aim of the HITRANS Thistle Assistance Card is to help anyone who has a difficulty in using public transport because of their age, disability or illness. It will quickly and easily tell the operator about any extra help that may be needed." Charlene Macleod, who runs Kyleakin Connections, a local charity based in the Old School in Kyleakin, Skye, said: "One of our day care users had raised the need for something like this last year so I can see how it will encourage anyone with a disability or concern about travelling independently to gain the freedom that using public transport can bring." 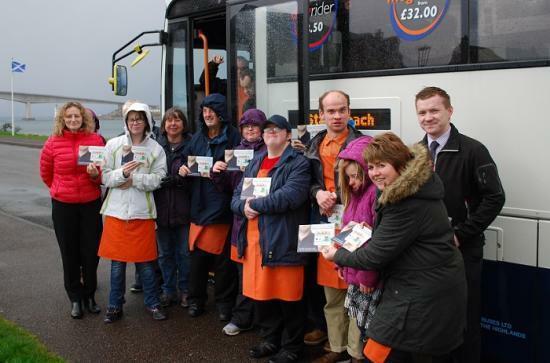 Iain Beaton, local area manager for Stagecoach North Highland, welcomed the new card and commented: "While many of our drivers know regular local passengers very well and provide the help they require, this card will make journeys easier for those in most need."